Here’s a Pac-Man game board to use with Roberts Ms. Pac-Man lesson. It’s nice because it doesn’t use all the ink of the black background in the actual Ms. Pac Man. I asked my TA to draw a Pac-Man board and he responded “I’m on it”. I told him a bunch of other math teachers would use it – so don’t make me a liar! I recommend cutting out a bunch of 1/2″ Ms. Pac Man’s to use with it. Here’s my desk of supplies! 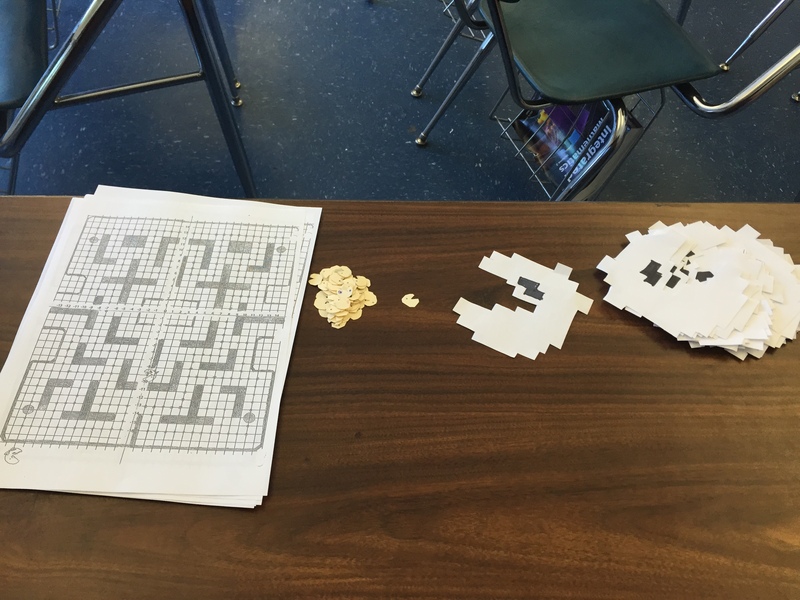 The small Pac-Man’s were an excellent manipulative for the students – every student was using the one I gave them. There’s a big difference between imagining how Ms. Pac Man would be oriented when she rotates, and actually rotating her and seeing how she is oriented. 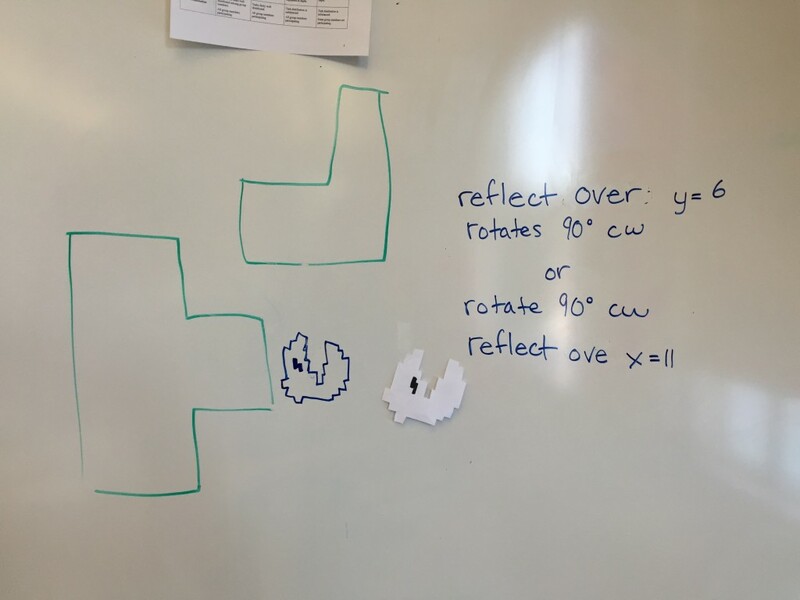 The larger Ms. Pac Man’s are because I am going to have the students go to whiteboards and discuss that first turn where Ms. Pac-Man both reflects and rotates. But I’m not showing my hand there yet – meaning I’m not going to bring up that first difficult corner. I’m going to wait until they find it. Each student gets 20 transformations to get the highest possible score. 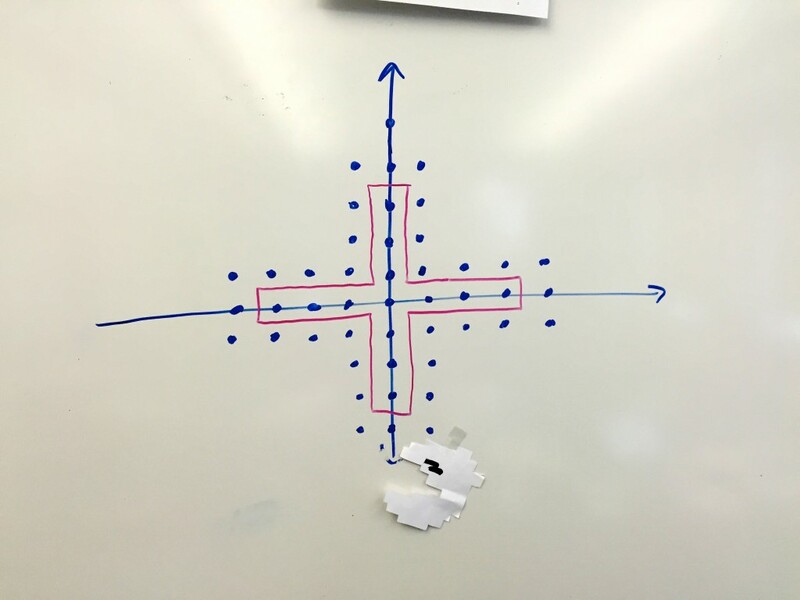 Each dot is worth 1 and the big dots are worth 10. Game on. I thought about going right to playing the game – but I would have had to tell them the rules of Ms. Pac Man’s motion. By first starting with Roberts lesson they were able to discover her motion themselves. After collecting some ideas from the class – they seemed to all agree that this was not just about translations. I showed them the video where Ms. Pac Man only moves with translations and discussed some of those properties. We collectively talked about her first two moves, and then I left them to go. 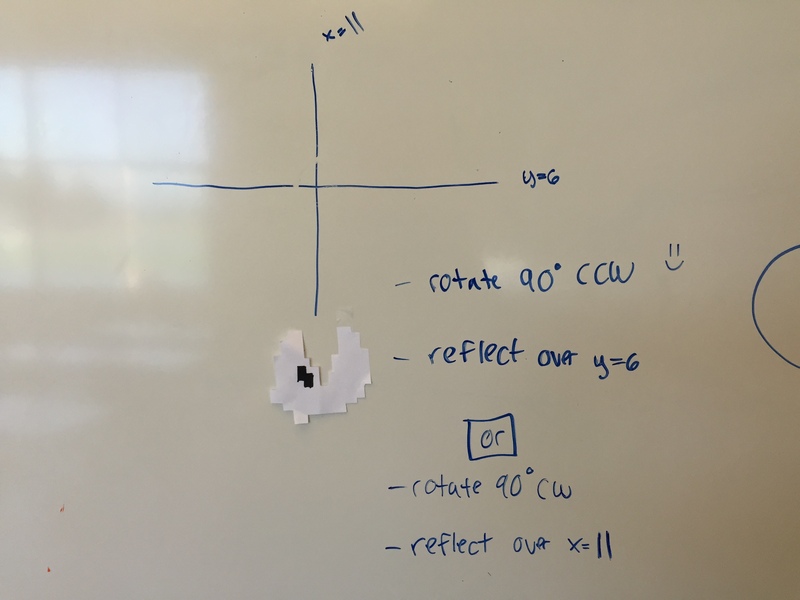 We had not directly talked about rotations – so this activity was their introduction to describing rotations by degree and CW / CCW. I just let them get started and fielded questions as they arose. Then after a couple minutes I talked to them about how to describe the first rotation. 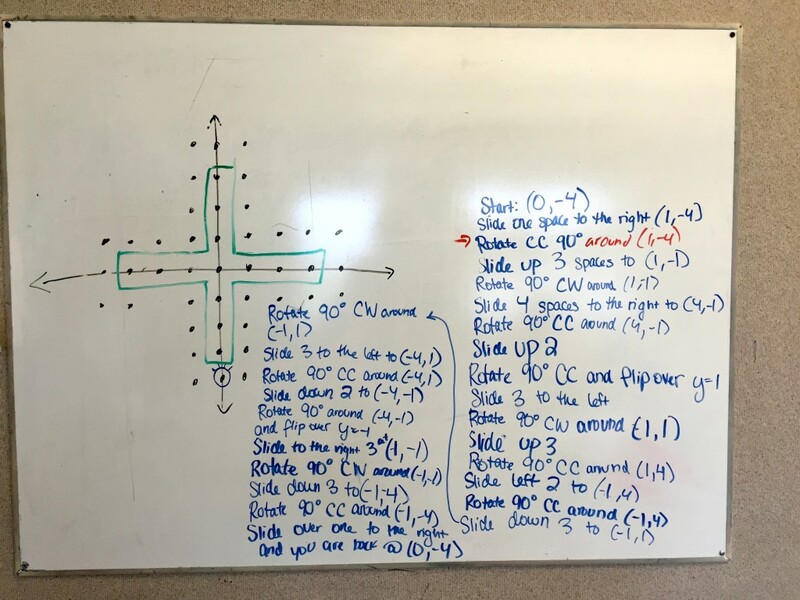 A couple groups hadn’t made it to that corner yet – so I first asked them something to the effect of “Why do you think that I picked this corner to bring you all up to whiteboards for collaboration?”. They manipulated the Pac Man and then told exactly why. 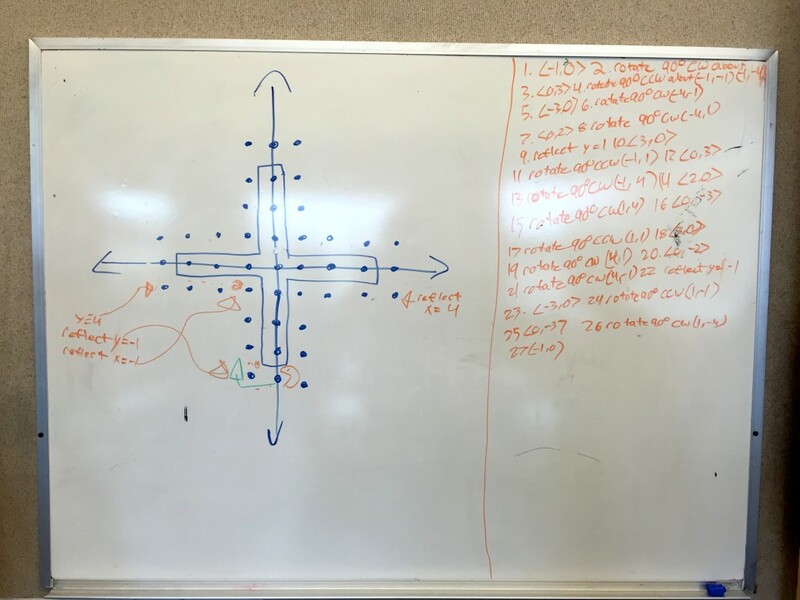 So all the students can develop the question regardless if they are actually at that corner on their board. Once they were up together I also asked them if we could make any generalizations about Ms. Pac Man’s movement. Does she always go up and down the same way? 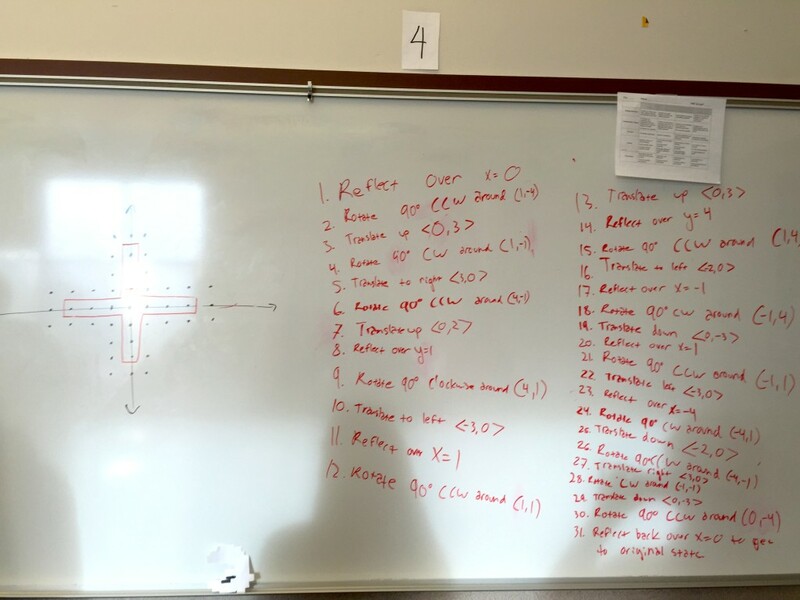 The next day I brought Ms. Pac Man back to Whiteboards and this was the opener – in groups of 2 or 3 they had to make Ms. Pac-Man move around the obstacle and collect all the dots. Engagement was very high – helped largely by the fact that they all felt they could be successful. This opener allowed me to go around an clean up some of their notation. There were definitely lingering misunderstandings about what line Ms. Pac Man should reflect over, and they were forgetting to say what point she rotated around. 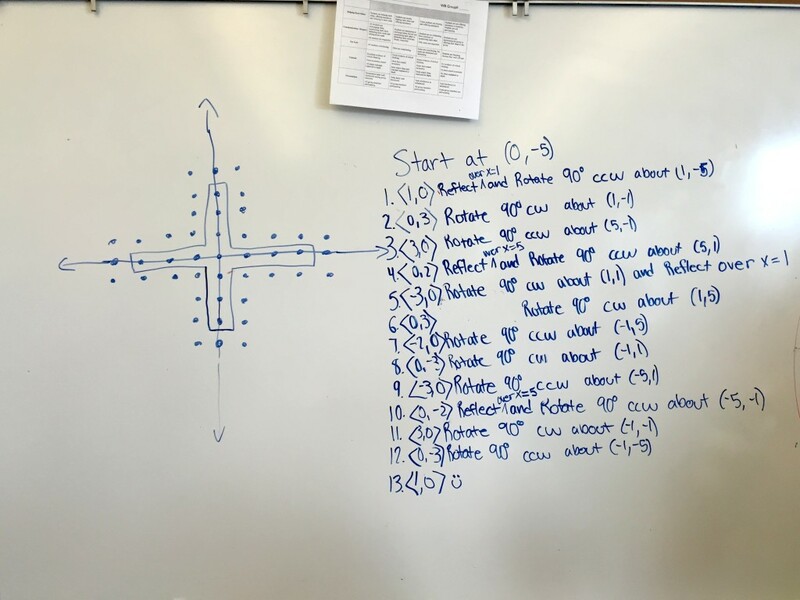 The activity served to solidify their use of proper notation for translations and reflections, and also served as a great introduction to rotations. I think it would work perfectly fine as an introduction to – or review of – transformations. All in all – Thanks Robert! p.s. 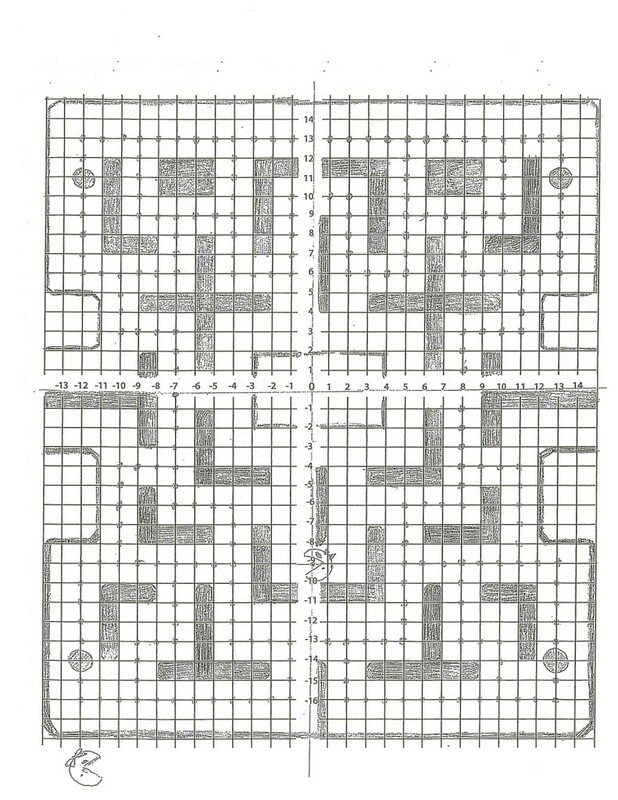 It’s also super easy to turn this into a test question – just make a small course for Ms. Pac Man and it’s all good.